The 1979 Book of Common Prayer is very clear with regards to the purpose of education and formation. In fact, it’s purpose is directly prayed for every Sunday during the celebration of the Holy Eucharist. It is found in all of the post-communion prayers, as well as the catechism section on ministry. It is found in the promises we make every time our worship includes a baptism. We pray, as we believe, the each baptized member –– no matter what age or stage –– it called to engage in an active ministry and mission, to be “sent out to do the work God has given us to do.” That calling is the purpose of education and formation. Liturgy is formation. “All baptized persons are called to minister in Christ’s name, to identify their gifts with the help of the church, and to serve Christ’s mission at all times and all places.” Through commitment to lifelong Christian formation for sustaining our ministries as part of our baptismal commitment we are “to continue in the apostles’ teaching.” Designed in content and context as a framework for the faith journey, the BCP offers prayers for birth and death, sacrifice and salvation, exodus and exile, and a vision of new life found in the community of faith that knows it is the living body of Christ. Each liturgical expression offers an opportunity to teach and learn. Many liturgists and educators might say we have not lived out the deep ethos of our current Book of Common Prayer as it is rooted in the baptismal language of formation and the ministry of all believers. How are we actively engaging our congregations in understanding that “Christians are fashioned (made), not born” (according to 3rd century theologian Tertullian wrote)? How are we preparing those to be baptized and deepening the life of faith of the already baptized? There is a new publication out that won’t solve everything, but it will help preachers and presiders, musicians, Christian educators, sacristans and altar guilds be more intentional in planning worship and formation following the Revised Common Lectionary. 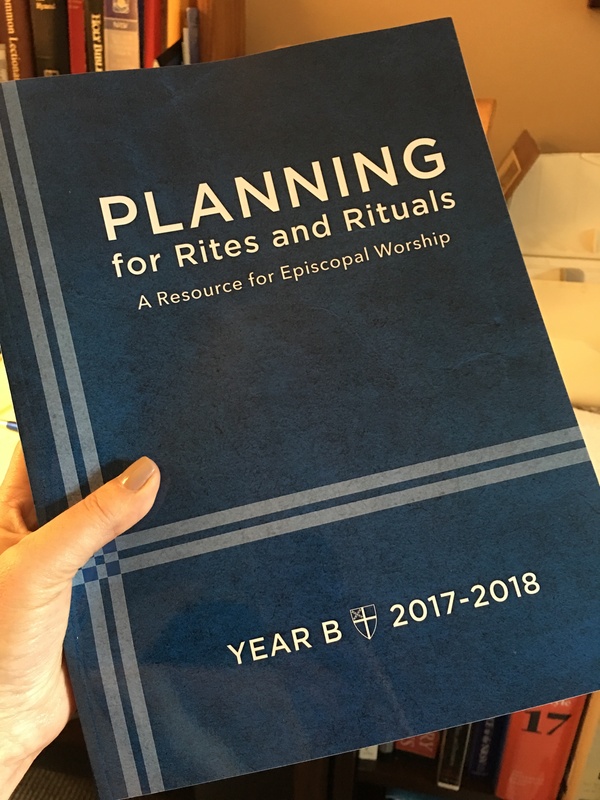 Planning for Rites and Rituals: A Resource for Episcopal Worship (Year B 2017-2018) will be a book you want to have on your desk, alongside The Prayer Book Guide to Christian Education, 3rd edition. In June 2017, the Center for Liturgy and Music at Virginia Theological Seminary held a gathering of liturgists entitled “The Once and Future Prayer Book Consultation.” Former Presiding Bishop Frank Griswold was on of the speakers: …the Church is not yet ready for prayer book revision. … the ethos, particularly the strong emphasis on baptismal ecclesiology, of the 1979 Book of Common Prayer has yet permeated the Church … the practice of communion without baptism has overshadowed the baptismal ecclesiology of the 1979 BCP. The Rev. Dr. Lizette Larson-Miller also spoke: … new voices including women, Latino/a, and LGBT folk are a much more vital part of the conversation in the Church today than in 1979. She has observed a change in ritual practice as liturgy has become more about entertainment than giving glory to God, giving rise to an almost obsession with new liturgical expressions. The second consultation was recently held at the School of Theology at Sewanee. And this week (October 23-24, 2017) The Once and Future Hymnal Symposium will be held at Virginia Theological Seminary to discuss “developments in culture, language, technology, and musical style.” The Hymnal 1982 was published 35 years ago, plus Wonder, Love, and Praise and Lift Every Voice and Sing II hymnals. 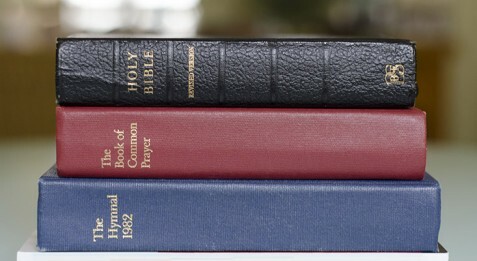 Do we need a new hymnal, too? All of these conversations seem to have begun as soon as the ’79 BCP was published. The Living Church had an article in 2015 that reviewed the many opinions and papers given over the years. The 1979 Book of Common Prayer is a catechetical document. Trial liturgies suggested the re-institution of the Catechumenate, and many dioceses and parishes have attempted to follow its model for adult formation. Stay tuned for another post about that …. What are your thoughts about “liturgy as formation” and prayer book revision? I’m really excited about this resource – already ordered a copy! Thanks for your work on it; it’s something our church really needs. One of the ways I find the current BCP limiting is that it doesn’t offer a lot of ways to mark the distinctive characters of the different seasons of the church year (compare the wonderful wealth of Common Worship’s Times & Seasons materials, for example). Among other things, it looks like this resource offers some ideas and approaches for filling that gap. On the question of prayer book revision, I agree heartily that there’s a baptismal and formational ecclesiology built into the 1979 BCP that we can all live into more deeply. But I confess that I’m puzzled by the argument – which I’ve seen several places, not just as quoted here – that revising the prayer book would mean losing that framework. Why would we revise away the good stuff? Why wouldn’t a revised BCP be build upon the same theological, ecclesiological and formational foundation? It almost reminds me of the whole “the new Ghostbusters ruins the old Ghostbusters” thing.